HomeBlogfeaturedBones – dangerous or safe? A few years ago I was asked to address a forum of 70 vets on natural pet diets. At my address was one of South Africa’s top orthodontic vets. I asked him to settle the issue about bones being dangerous or not. 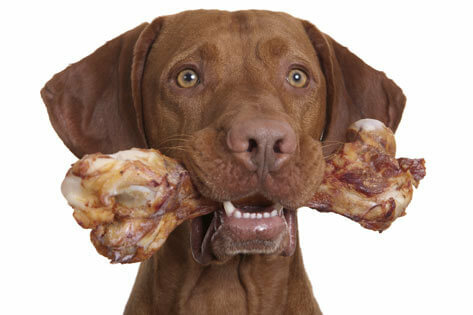 We all concurred that raw bone is safe and cooked bones extremely dangerous. Cooked bones denatures the calcium structures thus making the fragments sharp, brittle and dangerous. Raw bone, however is solid and holds exceptional nutritional values. Raw chicken bones, however, should be excluded. Bones are living tissue composed of living cells. Because bones are living tissue, just like any other part of the body, they are a complex source of a wide variety of nutrients. Bones contain minerals which are embedded in protein. They also contain fat. Chicken or pork is very high in the essential fatty acids. Central parts of most bones contain marrow, which is a highly nutritious mix of blood forming elements, including iron. Raw bones also provide natural antioxidant/ anti-ageing factors including enzymes. Bones also play a similar role to fibre, that is, a role of bulking out the food, thereby removing toxins and promoting general bowel health. Children play with toys and with computer games( sadly) to keep them entertained. Dogs chew bones. Often clients ask what cleans teeth. Well dried kibble does not. Raw bones do.